1. Joseph Parks c.1760 Along with his father, Joseph was one of the 73 participants in the four acre St. John River island rights grant. Historians’ best estimates put the proportion of adult white male loyalists somewhere between 15 and 20 percent. Approximately half the colonists of European ancestry tried to avoid involvement in the struggle — some of them deliberate pacifists, others recent immigrants, and many more simple apolitical folk. The patriots received active support from perhaps 40 to 45 percent of the white populace, and at most no more than a bare majority. The largest number of loyalists were found in the middle colonies: many tenant farmers of New York supported the king, for example, as did many of the Dutch in the colony and in New Jersey. The Germans in Pennsylvania tried to stay out of the Revolution, just as many Quakers did. Highland Scots in the Carolinas stayed loyal to the king. About 46,000 went to British North America. Of these 34,000 went to Nova Scotia, 2,000 to Prince Edward Island and 10,000 to Ontario. 7,000 went to Great Britain and 9,000 to the Bahamas and British colonies in the Caribbean. The 34,000 who went to Nova Scotia, where they were not well received by the residents who were mostly descendants of New Englanders settled there between the Arcadian expulsion (1755-1763) and the Revolution. In 1784, the colony of New Brunswick was separated from Nova Scotia for the 14,000 loyalists who had settled in those parts. John’s wife Mary Dean was born about 1775. She married John 17 Aug 1799 in Anglican Church, Gagetown, New Brunswick, Canada. Mary died in 1871 in Charlotte, New Brunswick, Canada. 23 Oct 1790 – Purchased lot 10 Dibbles Survey, 3rd Range, Queen’s Co., NB This was witnessed by David Parke. On Jan 9, 1802 this lot was sold. John was living next to his brother David in St. George’s Parish, St. Charlotte County in the 1851 census. Parks Mary F Wife 66 N.B. Parks Ann F Wife 28 N.B. Parks Mary Jane F Daughter 8 N.B. Parks Nathaniel M Son 6 N.B. Parks Abilgail F Daughter 4 N.B. Parks Louisa F Daughter 1 N.B. Sarah’s husband Josiah Foster was born 11 Jun 1758 in Elizabeth, New Jersey (this may be a baptism as he is given as b. in St. John’s Church). His parents were Ebenezer Foster (b. 1731 Woodbridge, New Jersey – d. 10 Dec 1787 Kings, NB) and Mary Beach (b. 1729). His grandparents were Stephen Foster and Martha Van Galen. Josiah died 9 Nov 1833 in Waterborough Parish, Queens, New Brunswick, Canada. i. Samuel Foster m. 27 Aug 1801 to Anne Sims. Samuel Foster and Anne Sims of Waterborough Parish, Queens Co., NB were married probably in Gagetown Anglican Church. It is assumed here, because of the time and location, that Samuel was Josiah’s son. This assumption may not be correct. A Samuel Foster petitioned for land in Queens Co. with Patrick O’Hara in 1804; and alone in 1818. Other petitions were in 1822 in Kings Co. and in 1857 in Kings Co. The 1822 petition seems to have been granted, resulting in 200 acres in Sussex Parish granted to Samuel Foster 18OCT1822. In 1868, in Carleton Co., Samuel Foster with: Jerusha Foster, John B. Foster, Maria Foster, Maude Foster and Sarah Foster petitioned for land. ii. Joshua Foster b. ca. 1792. With Josiah Foster and William Peters, a Joshua Foster petitioned for land in Queens Co. in 1815; and in Queens Co. in 1820, with Josiah Foster, William Peters, Charlotte Peters and James Brittain. In 1824, Joshua Foster applied for land in Queens Co. with Josiah Foster, Cushi Hatheway, James Brittain and William Peters. It is not clear if this Joshua was Josiah’s son, or the uncle of the same name. Joshua Foster petitioned alone in Queens Co. in 1847. A John Foster m. Westfield Parish, Kings Co., NB 3 Apr 1825 Catherine Armstrong. Both were of Westfield Parish. Whether this is the same John is uncertain. Another, or the same, John Foster m. 22 Nov 1832 Sarah Tufts. Again, both were of Westfield Parish. Witnessed his mother’s receipt for her £10 pension in Queens Co., NB in 1839.
iv. Stephen Foster b. ca. 1794, m. 25 Feb 1812 St. John’s Anglican Church, Gagetown, NB (or in Wickham Parish, Queens Co., NB) to Catherine Evans. v. William Foster b. ca. 1794, d. before 1833. Possibly William Josiah Foster m. Elizabeth Flewelling. In March, 1829 Benjamin was twice sued. Jonathan Yerxa of Douglas Parish [York Co., NB] asked to be paid £15 for diverse goods he had furnished, while John Simpson of Fredericton demanded £44 payment for the same from Benjamin and George Titus. After their marriage, Benjamin Titus, Jr. purchased land on the Den Road in Cambridge parish. He and his sons were listed as farmers there in 1861. Benjamin Titus died sometime between 1871, when he was still living with his family in Cambridge, and 1881 when Elizabeth was enumerated as a widow, supported by the labor of her sons Benjamin and Charles, still resident on the homestead. She died before 1891, when the family disappears from the Queens County census, probably before 1884, when her sons moved to Saint John. 13 Mar 1802 – Complaint against David Parks by John Watson re lot #11, Queens Co.
22 Mar 1802 – memorial for lot #11, SE side Washademoak Lake, Queens County. 7 Jun 1803 – Quitclaim lot #11 from David Park to John Watson. 11 Jun 1804 – Quitclaim for lots #10, 11 & 12 at Washademoak Lake, Queens Co.
24 May 1819 – Signed a document in support of the building of Holy Trinity Church, Springfield, Kings Co.
4 Sep 1824 – Petitoned for 400 acres in the Parish of Wickham. 16 May 1827 – Bought lot #4, Parish of Wickham. 26 May 1846 – Sold lot #4, Parish of Johnston (same lot as above). David was living with his son Jonah and next to his brother John in St. George’s Parish, St. Charlotte County in the 1851 census. Parks Mary Ann F Wife 33 N.B. Parks George M Son 5 N.B. Parks Mary F Daughter 2 N.B. Parks Phoebe Ann F Lodger 10 N.B. Parks David M Father 81 N.B. i. Mary Parks b. 20 Sep 1797 in Wickham, Queens, New Brunswick, Canada; 1 Feb 1877 Queens, NB; m. 28 Oct 1817 in Queens, NB to Daniel Slocum (b. 22 Feb 1797 in Hamstead, New Brunswick – d. 12 Jun 1885 in Queens, NB) His parents were Ebenezer Slocum and Esther Corey. Daniel and Mary had 8 children. ii. Hannah Parks b. 23 Oct 1798 in York, New Brunswick, Canada; d. 29 Aug 1836 Kingston, New Brunswick, Canada; m. 29 Mar 1819 in Queens, NB to Jesse Cromwell (b. 1 May 1797 in Springfield, Kings, New Brunswick, Canada – d. 1860 in Johnston Parish, Queens, New Brunswick) Hannah and Jesse had nine children. After Hannah died, Jesse married Hannah Redstone (b. Devon, England on 1814) and had 5 more children. iii. Nancy Parks b. 1802 in Queens, Canada; m. 4 Sep 1825 in Queens, NB to James Mullin (b. 1789 in Springfield, New Brunswick, Canada – d. 22 Dec 1855 in Wickham, New Brunswick, Canada) Nancy and James had had 6 children. After Nancy died, James married Susanna Hurder and had another child. iv. William Parks b. 1807 in Moose Island, Main River; d. 3 Jan 1881 Cambridge Narrows, New Brunswick; m. 23 Jul 1835 in Queens, NB to Harriett Knight (b. 17 May 1817 in Burton, Sunbury, New Brunswick, Canada – d. 24 Jul 1898 in Cambridge Narrows, New Brunswick) She was Phoebe’s sister. Her parents were Samuel Knight and Sophia Holland. William and Harriet had 6 children. vi. Frances Amelia Parks b. 1811 in Queens, Canada; d. 1871; m. 30 Sep 1840 in St John, New Brunswick to David Mansfield Wort (b. 1815 in Saint John, New Brunswick – d. 1881 in New Brunwsick) His parents were Henry Wort and Esther Slocum. Frances and David had 6 children. Mary’s husband Henry (Hendrick) Belyea was born 1766 in Cortland Manor, Westchester, New York. His parents were Hendrick Belyea and Engeltje Storm. Henry died 1851 in Greenwich Parish, New Brunswick. Henry and his four brothers served with the British Army during the American Revolution. One of them was taken prisoner. The family lost all of its property and farms in New York because they sided with the losing forces, so the British paid to resettle them in Canada. On April 26, 1783, a fleet of twenty ships carried 7,000 Loyalists from New York City to Nova Scotia. i. Robert Belyea b. 1 Jul 1793 in Greenwich, Kings, New Brunswick, Canada; d. 19 Aug 1877 Greenwich, Kings, New Brunswick; m. 22 Nov 1822 in Kings, New Brunswick to Margaret A Hawthorne (b. 1800 in Ireland – d. 13 Jul 1888 in Kings, NB) Robert and Margaret had eight children born between 1824 and 1840.
m1. 18 Oct 1819 in Saint John, Saint John County, New Brunswick to Mary Ann Day or Archibald (b. 1799 – d. 1829); Henry and Mary Ann had five children born in Kingston, Kings, NB between 1820 and 1828.
m2. 10 Jan 1831 in Greenwich Parish, Kings County, New Brunswick to Elizabeth Jane Belyea (bapt. 23 Jan 1803 Greenwich Parish, Kings County, New Brunswick – d. 17 Oct 1882 in Petersville, Queens, New Brunswick) Elizabeth Jane’s parents were Robert Belyea (1 Jul 1765 in Van Courtland, Westchester County, New York – d. 6 Sep 1830 Greenwich Parish, Kings County, New Brunswick) and Prudence Holly (b: 1770 in New York – d. 2 Feb 1861 Long Reach, Greenwich Parish, Kings County, New Brunswick) Prudence was one of the company of Loyalist who came to this country at the commencement [sic] of the American Revolution. Henry and Elizabeth Jane had eight children between 1831 and 1846. Frederick’s parents were Darius Pace (ca 1750 Georgia – 1823 Musquodoboit, Halifax, Nova Scotia) and Dorothy Raines (b. 1768 Wales – d. 1873 Nova Scotia). In July, 1784, the Paces arrived in Nova Scotia via Florida from Georgia They lived at Rawdon, Hants County, Nova Scotia which may be where Frederick’s birth of “Loudon Virginia” comes from. The first settlers in the Rawdon Township, Nova Scotia were United Empire Loyalists who had to flee their home in Ninety Six, South Carolina. The Rawdon loyalists as well as members of the 2nd American Regiment, were relocated from South Carolina to Rawdon, Nova Scotia after their defeat by General Nathanael GREENE in the Siege of Ninety-Six in th American Revolution (See my post Carolina in the Revolution). 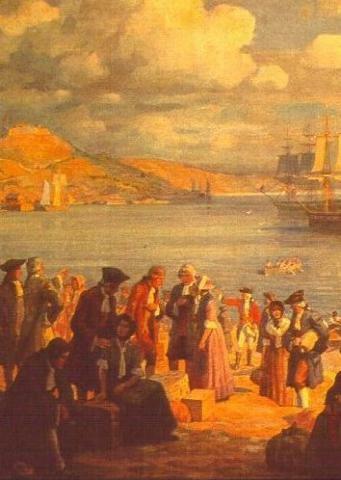 James was a Loyalist who migrated to Nova Scotia and Darius followed his older brother. Because of James’ political opinion during the Revolutionary period, all of his personal and real property was confiscated, he was convicted of treason, his arrest was authorized by the Georgia Council for Safety on 12 January 1776, and he was exiled from Georgia for life. 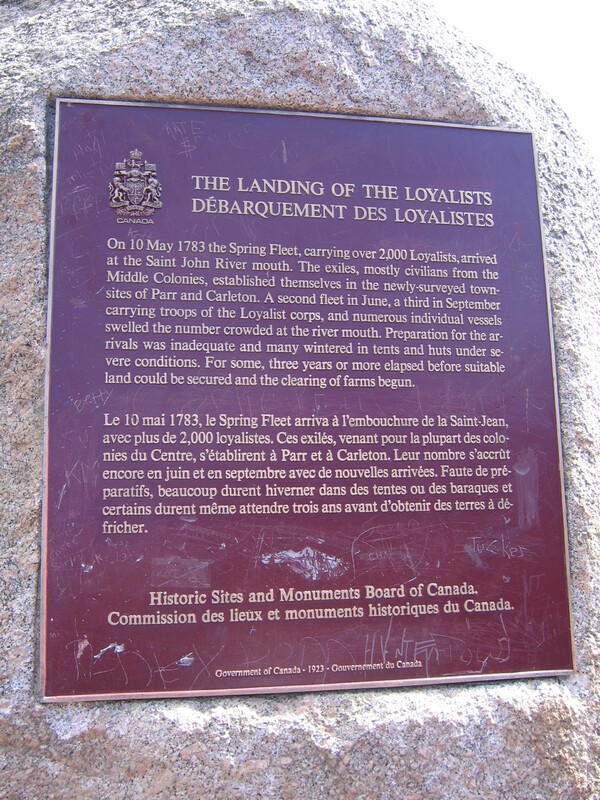 Darius followed his loyalist brother James to Nova Scotia. James Pace left Georgia with wife, Aurelia and three of his children, Willis, Drury and Thomas, destination Nova Scotia where James died shortly thereafter. Darius and Dorothy Raines of Wales were the parents of 10 children: Frederick, James, Sarah A., Richard, Darius, George, Edward, Charlotte, Shadrach and Jack. Descendants of James and Darius are scattered throughout the United States and Canada. The history of James and Darius, PACE, A FAMILY HISTORY AND LINEAGE, covers a period from ca. 1778 to Frederick Augustus Clouter, 1991. Many genealogies say the Frederick died 22 Aug 1891 in Port Huron, St Clair, Michigan, but that Frederick was born in New Jersey to Michael William Pace and Anna Eveland. His wife from 1850 to 1880, Penelope [__?__] was born in 1818 in Canada or New York. They were married in Ontario and their list of 15 children is completely different. vi. Rachael Belyea b. 1805 in Kings, NB; m. 17 Sep 1832 in Saint John, NB to Alexander Beckett (b. 1805) Rachel and Alexander had two children. vii. Nancy Ann Belyea b. 1808 in Greenwich, Kings, New Brunswick, Canada; m. 2 Jan 1832 in Queens, NB to Alexander Cochrane (b. 1796) Nancy Ann and Alexander may have had around 8 children. viii. Isaac P Belyea b. 1812 in Greenwich, Kings, New Brunswick, Canada; d. Mar 1888 Monticello, Maine; m. 6 Mar 1836 in Queens, New Brunswick to Elizabeth Jane Barnett (b. 1818 in Ireland – d. 5 May 1877 in Greenwich, Kings, New Brunswick) She was Margaret’s sister. Her parents were George Barnett and Jane Burke. Isaac and Elizabeth Jane had 11 children between 1837 to 1856.
m1. 28 Sep 1835 in Queens, NB to Margaret Barnett (b. 1816 in Ireland – d. 1845 in New Brunswick) She was Elizabeth Jane’s sister. Her parents were George Barnett and Jane Burke. John and Margaret had 5 children. m2. Rhoda Ann Gower (b. 1826 New Brunswick – d. Greenwich, Kings, New Brunswick, Canada) John and Rhoda had eight children between 1847 and 1861.
x. Edward Belyea b. 1818 in Greenwich, Kings, New Brunswick, Canada; d. Greenwich Parish, Kings, New Brunswick; m. Clarissa [__?__] (b. 1827) Edward and Clarissa had two children. Nathan’s wife Mary MacDonald was born 20 Sep 1781 in Glasgow, Scotland. Her parents were John MacDonald and Rebekah [__?__]. Mary was baptized by Rev. David Crandall at Upham Baptist Church about 1836. She was mother of 12 children, 8 sons and 4 daughters – all but one listed. She had 47 grand children and two great grandchildren when she died in 1856. Mary died 13 Oct 1856 St. Martins or West Quaco as it was called then by Rev. W. Jackson who preached the funeral sermon. John was a school teacher of superior education being qualified to teach eight different languages, ancient and modern. He taught in the Old Madras School, or National School, at Fredericton, NB, which had been established there in 1820. These schools were supported by the Society for the Propagation of the Gospel, the National Society in England, the Church of England, and the New Brunswick government. In order to keep costs to a minimum, a system of monitors was used by which a large number of students could be taught by a few teachers. The instructors worked directly with the older children who then passed on the lessons they had learned to the younger ones. Although there was some concern over the control exerted by the Church of England in these schools, it was the most effective educational system in the province prior to the passage of the Common Schools Act of 1871. Madras schools were to remain in operation in New Brunswick until 1900. Lived 12 years in USA after their 1802 marriage. 1814 re-entered New Brunswick, Kings Co.
10 Dec 1818 – Petiton for land, Parish of Springfield, Kings Co.
2 Dec 1819 – follow up of same petition. c 1836 – Bapt. Mary, Baptist Church, Upaham, Kings Co., by Rev. David Crandall. 31 Dec 1843 – Nathan died in St. Martins. i. John Parks b. 12 Dec 1803 in Newbury, Mass; d. 6 May 1873 in St. Martins, NB, Canada; m. 17 Oct 1826 in New Brunswick to Hannah Doherty (b. 24 Dec 1809 – d. Bef. 1861) John and Hannah had 10 children born between 1828 and 1849.
ii. Charles Parks b. 16 Sep 1806 in Newbury, Mass; d. 20 Jul 1807 in Newburyport, Mass. ix. Rebecca Parks 19 Mar 1824 in St. Martins, New Brunswick; d. 10 Feb 1901 in Everett, Mass. ; m. 20 Jan 1843 in St. Martins, New Brunswick to Caleb Templeman (b. 18 Mar 1821 in St. Martins, New Brunswick – d. 08 Jun 1869 in Chatham Head, New Brunswick) Rebecca and Caleb had nine children born between 1844 and 1864. After Caleb died, Rebecca immigrated to the United States in 1871. In the 1900 census, Rebecca was living in Townsend, Middlesex, Mass with her son-in-law Warren D. Hinds. Rachel’s husband Silas Titus was born 1765 in New York. His parents were Benjamin Titus and Ruth Bryan. Silas died in 1817 in New Brunswick, Canada. Although only two children can be attributed to their marriage with certainty, there are several others suggested by circumstance. Abigail Titus who married in 1816 at Fredericton, Mary Titus who married there in 1822, Olivia Titus, who married in 1824 at Douglas, and Frances Titus who married in Douglas in 183… may be daughters. Allan and Benjamin Titus appear at different times in court documents between 1824 and 1836, mostly for small debts incurred at Fredericton and Douglas, and may be sons. On one occasion, in 1829, Benjamin Titus was named with George Titus for a combined debt of £44 to the merchant John Simpson of Fredericton, for “divers goods, wares, and merchandize.” There is no doubt that George Titus was a son of Silas and Rachel. George Titus was a lumberman and later lived at Edmundston. Silas and Rachel Parks were still living in New Brunswick in 1817, residing in St. Mary’s parish, York County, when their daughter Andelina Titus was baptized at Gagetown. This is the only child for whom a baptismal record has yet been found. 29 Sep 1784 – Grant of land between Musquash and Saint John, Saint John Co.
4 Jul 1794 – Sale of lot #25, Upper Musquash Island, Saint John Co.
1802 – Memorial for land on Washademoak Lake, Queens Co.
i. Mary Titus b. 17 Sep 1796 in Fredericton, New Brunswick, Canada; d. Nov 1855 in Fredericton, New Brunswick, Canada; m. 2 Jun 1822 to Isaac Vivian Hutchinson Segee (b. 18 Mar 1801 in New Maryland, York, New Brunswick, Canada – d. 15 Apr 1837 in Fredericton, New Brunswick, Canada) Mary and Isaac had four children born between 1825 and 1833. Some genealogies say Mary that married Issac was born in 1803, died in 1837 and was the daughter of Benjamin Titus (1771-1812) and Elizabeth Clark (1775-1798). In 1824 Allen Titus was sued by Fredericton merchants William McKeen and Benjamin Blyther to recover £20 for diverse goods and merchandise. He was a defendant again in 1829 when another Fredericton merchant demanded payment of an £11 promissory note. iv. Olivia “Olivea” Day Titus b. 1804 in New Brunswick, Canada; d. aft. 1851 census York, NB; m. 3 Oct 1824 in Douglas Parish, York County, NB. to William Blyther (b. 1806 Douglas Parish, York, NB – d. Aft 1871 census St Ann’s Ward, York, New Brunswick) Olive and William had eight children born in York, New Brunswick between 1826 and 1848. Benjamin Titus was a witness to the marriage of Olivia Day Titus in 1824. In March, 1829 he was twice sued. Jonathan Yerxa of Douglas parish asked to be paid £15 for diverse goods he had furnished, while John Simpson of Fredericton demanded £44 payment for the same from Benjamin and George Titus. In 1831 Benjamin married his cousin Elizabeth Foster, daughter of Josiah Foster and Sarah Parks. After their marriage, Benjamin Titus Jr. purchased land on the Den Road in Cambridge parish. He and his sons were listed as farmers there in 1861. Benjamin Titus died sometime between 1871, when he was still living with his family in Cambridge, and 1881 when Elizabeth was enumerated as a widow, supported by the labour of her sons Benjamin and Charles, still resident on the homestead. She died before 1891, when the family disappears from the Queens County census, probably before 1884, when her sons moved to Saint John. vi. George Titus b. 1812 in New Brunswick, Canada m. 1 Feb 1859 in Eglise de St. Basile, Claire, Madawaska Co., NB to Bridget Gallagher (~1811 New Brunswick – d. 20 Dec 1863 Edmundston, Canada). Bridget first married William Clancy. George Titus reappears in 1859 in Victoria County, (which then also included all of what is now Madawaska County.) Having converted to Catholicism he married Bridget, widow of William Clancy. George and Bridget resided at Edmundston, where they were enumerated in the 1861 Census. vii. Frances Titus b. 1814 in New Brunswick, Canada; d. 18 Apr 1895; m. George Brewer (b. 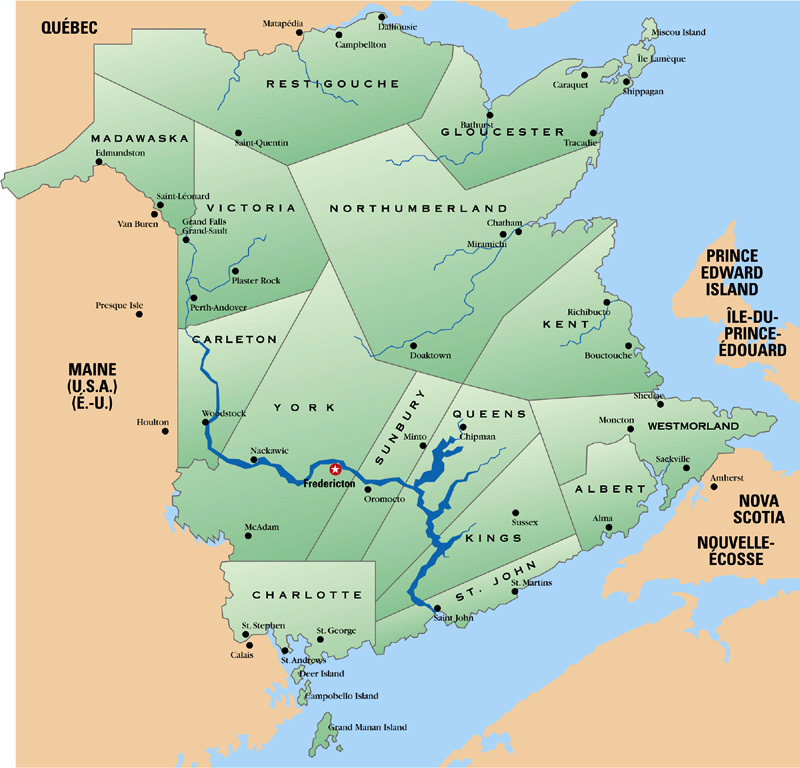 1806 New Brunswick – ) His parents were John Brewer and Elizabeth Yerxa. Frances and John had seven children born between 1837 and 1849.
viii. Andelina Titus b. 28 May 1816 in St. Mary’s Parish, York Co., NB; m. 17 Jan 1828 in Waterborough, Queens Co., NB to Richard Stephens (~1795 – 1878) Andelina and Richard had eight children born between 1834 and 1852. This entry was posted in -8th Generation, Immigrant - North America, Line - Miller, Storied, Veteran and tagged Loyalist, New Brunswick, Skinners Greens, St John. Bookmark the permalink. Hello again – saw the name Joseph(son of Nathaniel) – any idea if Joseph had a children? He would be the right age to be the Father of my Joseph who was living next to George Parks in Houlton in 1850. Perhaps this is the connection? He was 48 in 1850 and born in Unity ME.